" This isn't you, Joker. " " And you're the expert. " " You don't work well with others. " " Stag and I are peak predators, prime examples of evolution. We're practically family. " " The Stag doesn't have family. " " Blood brothers, then. But the blood's all yours. We carve out your heart, the crowd goes wild, and we shove off for Shamba-La. " " Good luck. People say I don't have one. " 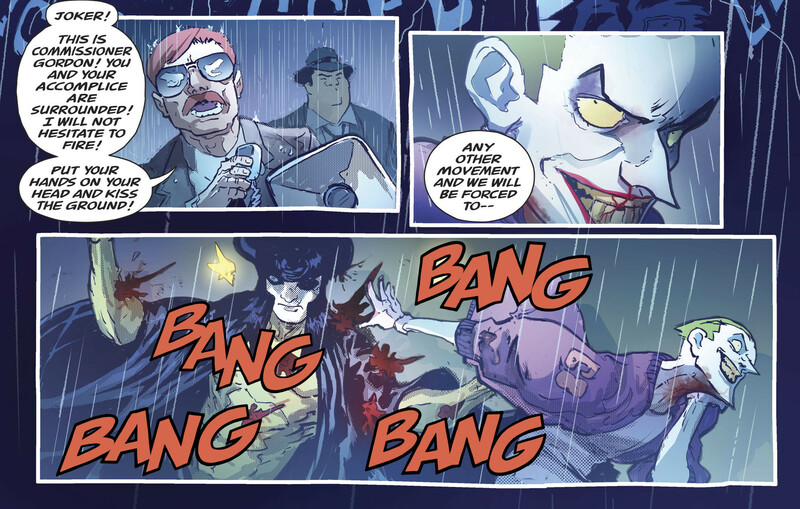 The Joker noticed another tone in the laughter. The villains' faded, leaving only that uncanny one to echo. 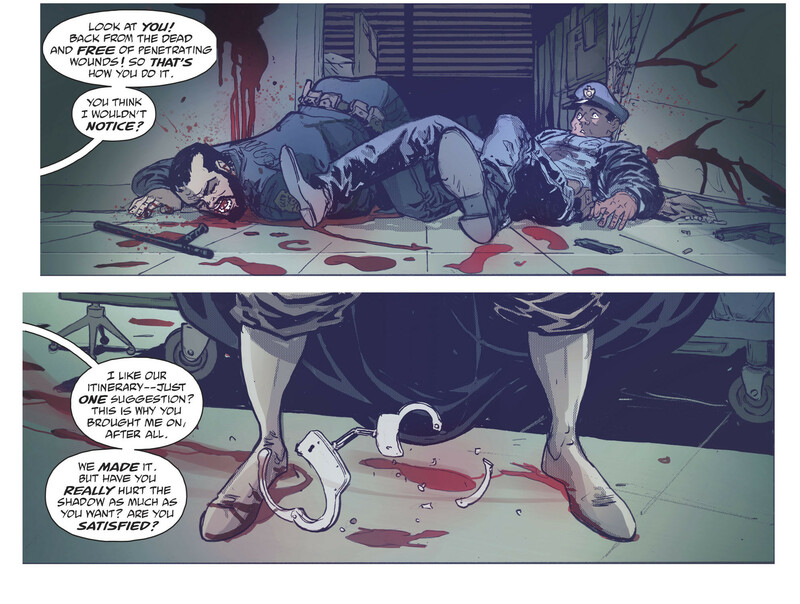 He shot Batman's ropes off. Batman dropped to the ground. He and the Shadow went at the villains. 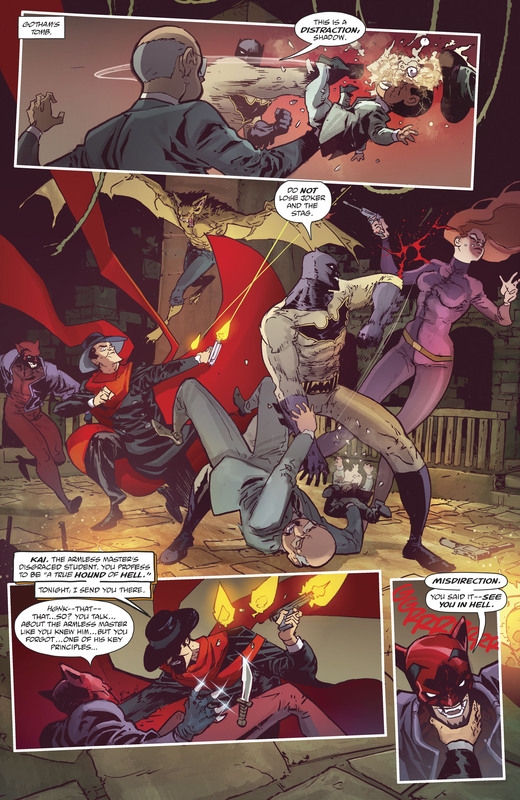 Meanwhile, the GCPD - whom Alfred had put in an anonymous call to, after the Shadow'd left his custody - were rushing to where the Shadow'd gone. Aboveground, the GCPD pulled up outside the Gotham Tobacconist's Club. 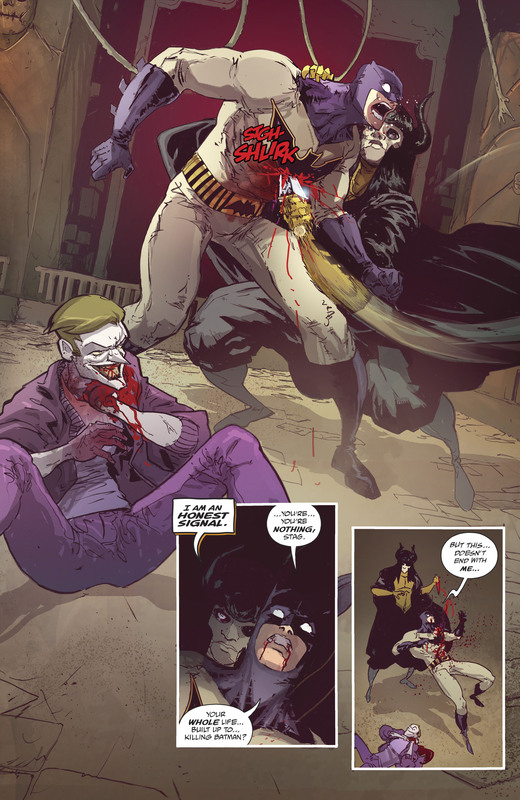 Underground, the Joker got his arm around Batman's neck and drew a scalpel. The Shadow pointed his guns. The Stag and the Joker exited, briefly pursued by the Shadow's bullets. The Stag and the Joker had opened the door on the aboveground exit they'd been heading up to, into the face of the GCPD's guns. 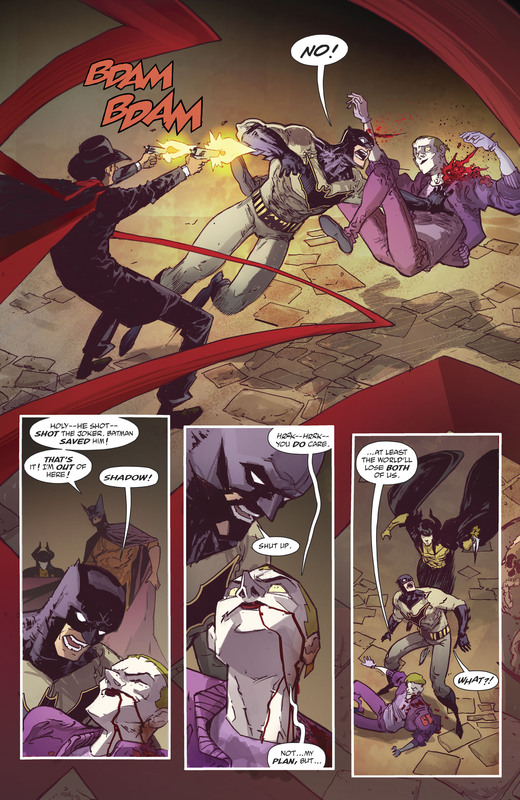 Below them, the Shadow admonished Batman's foolishness. 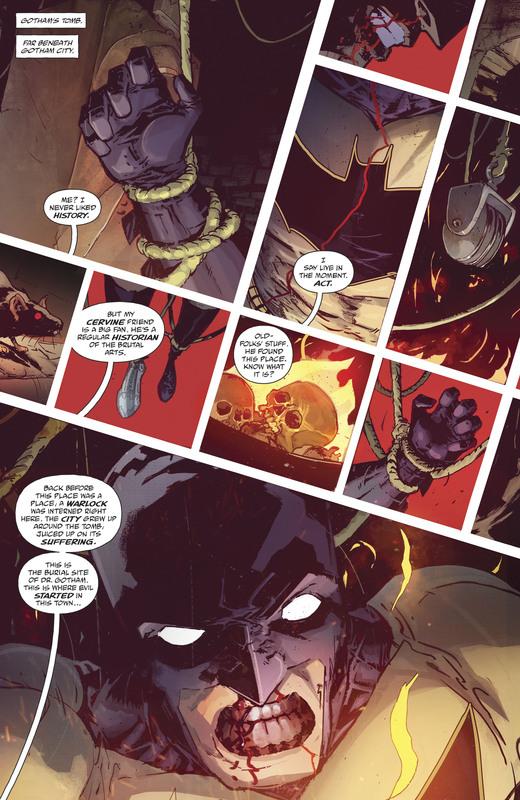 Batman's response was a request to cauterize his wound with one of the charcoals lying around, and an explanation of himself. 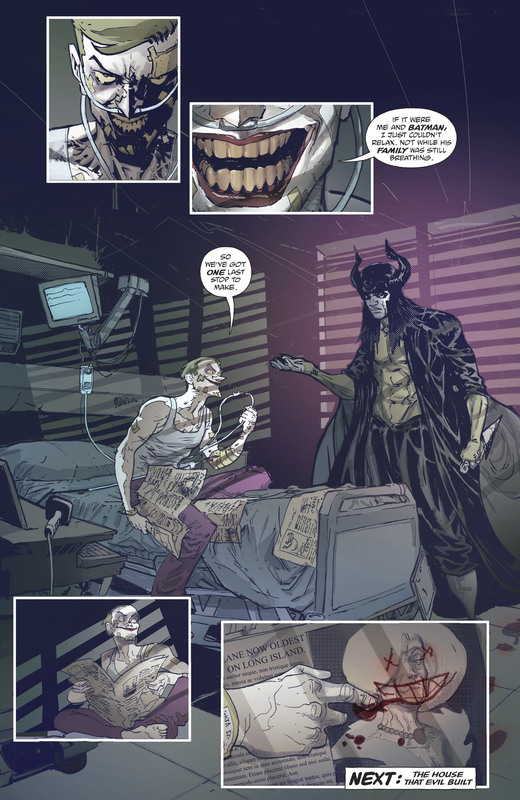 Later, the Joker received a visitor in the hospital. 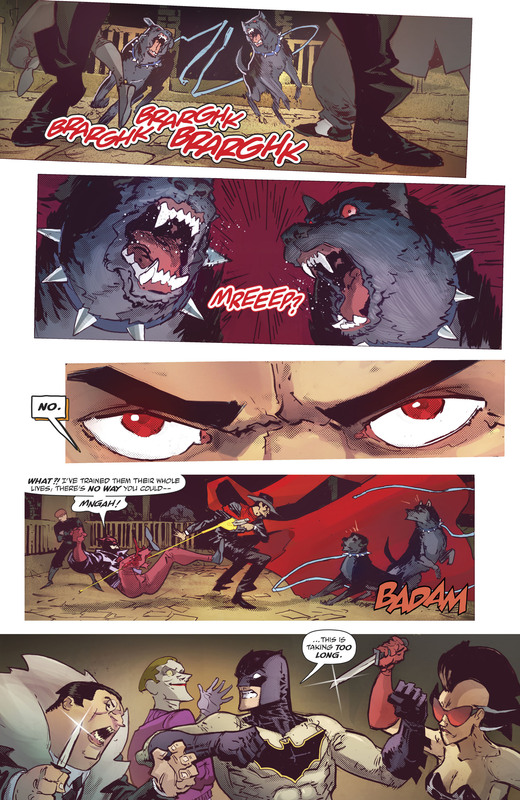 (Pagecount's 7 and a little under 3/20ths of 22 from 2017's Batman/the Shadow #4.